Location: Vieu-d'Izenave, in the Ain departement of France (Rhone-Alpes Region). 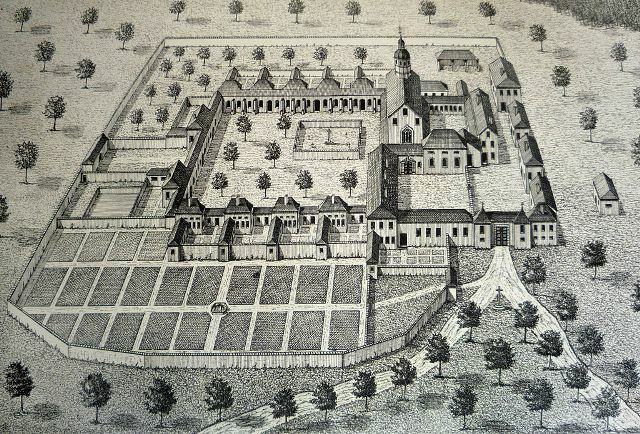 Notes: The Chartreuse de Meyriat was a former monastery affiliated to the Carthusian order. It is located on the Vieu-d'Izenave town in the department of Ain. It remains today in ruins. The monastery was founded in 1116. One of its founders is Ponce de Balmey, canon and official of the Metropolitan Church of Lyons. The brothers Ponce (Garnier Balmey and William Balmey) confirm and guarantee the concession. A first priory is erected under the name of Stephen and a second under the name of Mary. It is managed by more than fifty-six religious scholars and priors, St. Bruno's disciples. Towards the end of the twelfth century, may be forward Meyriat monks sent by the prior Guigue, are at the origin of the founding of the Charterhouse of Aillon, in the Bauges. The area of ​​the monastery was mainly extended over the valley and the valley Brénod with some antennas towards Maillat and the vineyards of Cerdon. The most important were the fir forest of Meyriat. The importance of the monastery was consequent on that area until the French Revolution. It was abandoned in 1791 and subsequently destroyed and looted. It remains only a few ruins.